Home > News > Help! Public or Private Cloud? Help! 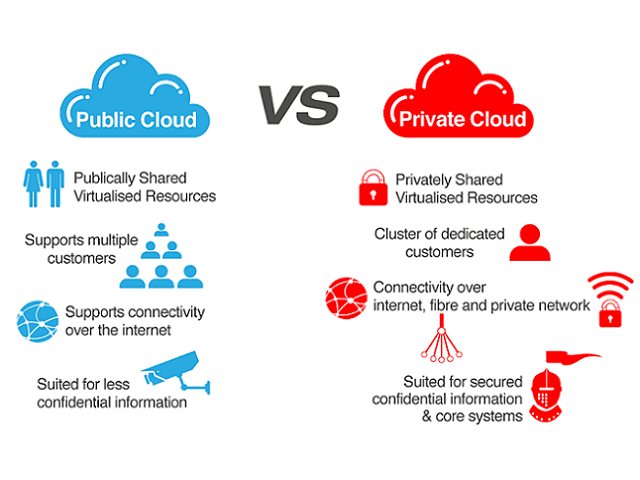 Public or Private Cloud? So you’ve just made the decision to move your data to the cloud. Aside from the fact that you should have considered this option years ago, congratulations! Your data will be more secure and your business will run more efficiently, among many other benefits. However, you quickly realize that it’s not that simple. There are several cloud options to choose from; which one should you choose – public, private or hybrid cloud? Before you start freaking out, we recommend you settle down. You are one of tens of thousands of people who are “lost” when it comes to choosing a cloud strategy. Even CIOs with decades of experience find it difficult and cumbersome in trying to figure out the direction they need. However, it doesn’t need to be so stressful. Allow us to explain. Looking at it from a macro level, aside from where the data is being stored, it would seem that there isn’t that much of a difference between a public and private cloud. But once you dig deeper, you come to realize that there are many minor and important factors to look at in order to conclude what is best for your business. Examples of things you need to consider before pulling the trigger are operational expenses, budgetary limits, utilization and support rates, elasticity, employee competence, security needs, and many other essential dynamics that factor into the buying equation. There are many benefits to using a public cloud. If you are limited in financial resources but still require a good amount of space to store your data, using a public cloud is your best option. You will oftentimes find good public cloud pricing plans that offer a sizable amount of data storage. In virtually all instances, a public cloud will be the cheaper option of the two. Additionally, public clouds tend to use the latest technological advancements (hardware, software, etc. ), have better utilization rates, provide greater elasticity, and continually test your applications and networks. Likewise, there are many benefits to using a private cloud. Though it will be more expensive, a private cloud comes with better security. The naysayers will argue that employee competency is the key behind security but that isn’t true. The security is literally in your control; you, along with your IT department, set up firewalls and other security measures to best suit your requirements. Moreover, as pointed out by many people, public cloud service providers such as Google or Amazon are constantly dealing with hack attempts. Even if you are a fairly large enterprise organization, chances are you are dealing with a very small amount of hack attempts. In addition to better security, a private cloud is custom designed for your business, with you defining everything from start to finish. Lastly and likely most importantly, technology isn’t flawless. Issues will arise, even within cloud computing. When operating a private cloud, you have clear ownership and responsibility. There’s an issue? You set the prioritization when needing to fix the issue. Try dealing with a third party cloud provider who provides you with a public cloud when something goes wrong. The delays can pile up. As is the case with all things in life, there are pros and cons to everything. A public cloud seems to be the more convenient and cheaper route, however a private cloud can offer a customized offering with better security. So, what should you choose? It’s actually not to hard to answer. If you are a small-mid sized business with a common service (for example backup or hosted VoIP), using a public cloud should do the trick for your business. There is no need for building out a private cloud that will tack on additional cost. However, if you are a large enterprise where security and certain requirements are a necessity, and especially if money isn’t a concern, you shouldn’t even consider a public cloud.